Catholic Charities Diocese of Arlington, VA (CCMRS) stations two Employment Specialists part time at two American Job Centers. This strategy delivers expanded refugee access to mainstream workforce resources and illustrates success factors that make colocation beneficial for clients, American Job Centers and CCMRS. the American Job Center perpective on this successful collaboration strategy. This case study, written by professional writer and former CCMRS Job Developer Erin Voorheis, is one of five that Higher will make available over the coming months to help us all learn from each other about successful strategies for strengthening our collaboration with the mainstream workforce system so that refugees can better access workforce services provided across the country for all U.S. job seekers. Remember last week’s Reader Question from Jenny Barischoff, who is starting a refugee resettlement program in Salem, OR? You contributed so many helpful resources to support her important employment volunteer strategy that they deserve their own post. Click here for all of the curriculums, forms and resources to help employment volunteers and mentors you contributed for Jenny. In addition, also consider the employment volunteer program structure from Friends of Refugees in Clarkston, GA and the Lutheran Immigration and Refugee Service (LIRS) employment mentoring guide. Several resources give volunteers information to help clients prepare for interviews or complete job applications and online personality assessments. Others are designed to encourage volunteers to reinforce important messages clients hear from others in your agency. This collection is well worth investigating to support other aspects of our work. Thanks to World Relief DuPage/Aurora, Catholic Charities Diocese of San Diego, CA, New American Pathways in Atlanta, GA, Integrated Refugee and Immigrant Services (IRIS), New Haven, CT and African Community Center of Denver, CO for helping Jenny – and all of us! When it comes to the long-term integration of refugee families into US communities, the importance of volunteers and mentors cannot be overstated. While resettlement agencies and employment programs do a great job at providing core services that help refugees become self-sufficient in the most basic sense, it can be difficult for refugees to know where to go from there. Ongoing relationships with American families or career mentors can be a significant encouragement to new refugees, helping them feel more connected to their new community and more hopeful about their future. For a moving example of what this can look like, check out this recent article published in the Knoxville News Sentinel about the relationship between a Congolese refugee family and an American family in Knoxville, TN. The article does a great job at showing the complimentary relationship that can exist between a refugee resettlement agency and local volunteers. The article also provides helpful background on the history of the Congolese refugee crisis, the trauma that many of these refugees have faced, and the difficulties of family reunification when families are separated. Higher has done several post in the past on both Congolese refugees and career mentoring. Explore these topics further and share your success stories with us at information@higheradvantage.org. a success story from the African Community Center’s Commercial Food and Safety Service Training Program. the value in forging relationships with community colleges. Think food service means dead end dishwasher jobs? Reconsider with this story, and a previous Higher blog post with suprising industry stats about upward mobility in the restaurant field. Last week’s Imprint webinar highlighting Canadian models for supporting skilled immigrant employment was just as valuable as I had hoped. There is so much we can learn from the Canadian experience that I’m still processing how to share it in Higher’s blog. To get started, I will share the impressions of three readers who attended. Stay tuned for more takeaway’s from the Canadian experience. US refugee employment networks can pick and choose parts of the webinar that are beneficial to refugees. I plan to incorporate ALLIES Creating Impact Locally model with our skilled refugee professionals. Here in Portland, Maine our refugee employment networks already utilize the Inter-governmental Roundtable model. The City of Portland, the Department of Labor, Adult Education, Community Colleges, the Chamber of Commerce and the Maine Hotel/Inn Keepers Association have been working together for the past 6 months about training and hiring skilled refugees to work in that sector. Several points resonated with me as an employer. I like the mind set of moving the employer toward the culture of the refugee versus only making the refugee more Canadian. In my experience, hiring refugees is definitely a two way learning curve. 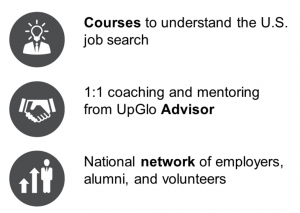 I like the concept and terminology of an Employer mentoring program as opposed to volunteer mentoring programs. Employers will be sold on the benefits for them, including identifying hidden talent and developing cultural competencies in their staff. I’m going to think more about the term “artificial poverty” describing poverty that is driven by the system. The presenter mentioned employers as successful spokespersons for the value of our clients in the work place. That’s something we are doing a bit through our refugee forum that creates networking opportunities between refugees and employers. Sadly, I got pulled away right in the middle to follow-up on an unexpected job opportunity, so I’m looking forward to learning more from Higher. Across the country, mentoring programs are an increasingly common strategy to boost employment outcome and client success. Some programs target new arrivals. Others focus on clients ready for job upgrades or professional recertification. A 2013 Canadian study of a mentoring initiative targeting newly arrived immigrant professionals offers evidence to support what we already believe. Mentoring really works. In the 12 months of the study, participants working in their professional fields went from 17% to 71%. Incomes, employment and full-time employment also rose significantly. Download the full report on our website. Higher will continue to follow the progress of a very successful employment mentoring pilot project at Lutheran Refugee Services of Lancaster, PA, which will be replicated in a few more sites over the next year. The current issue of Higher’s newsletter, just released yesterday, highlights another great example from USCCB Affiliate Catholic Charities Maine in Portland. If you missed it, click here for a link to the article. A lot has been happening in the Lancaster, PA employment mentoring pilot program we’ve highlighted in previous posts. Eight months into an initial one year pilot, the third group of 12 more refugee-mentor pairs is being finalized to reach a total of 30 teams. Here are a few stories and valuable lessons learned through our ongoing partnership with Lutheran Refugee Services (LRS) of Lancaster, PA and LIRS. The project seeks to deepen refugee social integration through employment-focused mentoring. Job shadowing, community college orientations and informational interviews are just a few of the opportunities being generated through the program. One mentee has been preapproved for a home loan and is going through the learning experience of buying a home with the help of his mentor. All of the refugees particip ating in the program are gaining community ties, opportunities to practice English and confidence in their ability to engage and interact with their new communities. For example, Khem and Pramila Subedi and Khem’s mentor Al Duncan, CEO of Thomas E. Strauss, Inc. attended a recent LIRS Board Meeting to talk about their mentoring experience. (See their photo at left.) Khem says that through his participation in the mentor program, “I am getting wider every day.” Al feels that mentoring is a common and valuable experience in our country and it’s not so different to involve refugees. It’s hard to capture in writing the energy and motivation present in the room whenever the teams get together, as they did this past Saturday to discuss an important lesson lear ned so far. The initial thinking was that each pair would follow a very unique path based on the opportunities available to work towards achieving specific career goals. Computer skills, advanced ESL and the ability to access additional education and training suggest the need for some common resources and steps to achieving any individual career goals.